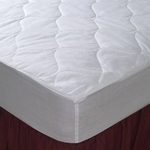 The Value Fitted Mattress Pads are our best selling quilted mattress pads and they ship quickly, within 1-3 business days. They are perfect if you need a low-cost solution to cover and protect your hospitality and commercial lodging mattresses. These pads cover the mattress like a fitted sheet for a non-slip fit. The Value fitted mattress pads are constructed to last wash after wash. A light-weight bonded polyfill is quilted between a poly/cotton top fabric with a microfiber bottom fabric for durability and faster drying. The mattress pad sides have a 14" woven poly/cotton skirt with elastic that wraps the entire skirt bottom for a snug fit. Purchase wholesale by the bulk case pack with Fast & Free Shipping. 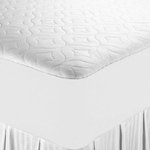 Available in Twin, Full, Queen, and King mattress pad sizes. Durable 14" poly-cotton skirt with enclosed elastic band around entire bottom for a snug fit. 3 ounces of down-alternative polyester batting per square yard.